The Fort Hood Area Habitat for Humanity has experienced a season of giving for the last several months, with a late push of donations coming in last week totaling nearly $20,000. Realty Executives presented Habitat with a check for $2,350. The donations were from the business’ annual Chili Cookoff that celebrated its 19th year this past October. “We’re still praying for this to become a citywide event, so we can raise 10 to 15 thousand dollars for you (Habitat),” Raye Mayhorn, CEO of Realty Executives, said. The check was presented by Mayhorn and members of the Omega Psi Phi, Omicron Pi Chapter, who were the largest supporters for the event. Mayhorn said the cookoff fundraiser always goes to support Habitat and takes place the second Saturday of October every year in the Realty Executive parking lot. Back at the Habitat office, Ellis Air Conditioning’s Preston and Mason Ellis stopped by to show their support from ending the year with about $4,500 in donations they have contributed over the course of this year, along with some services and air systems donated. Killeen Mayor Jose Segarra, owner of Exit realty and Office Manager Yamy Bermudez presented a check of $12,239 showing their year-end support for Habitat. 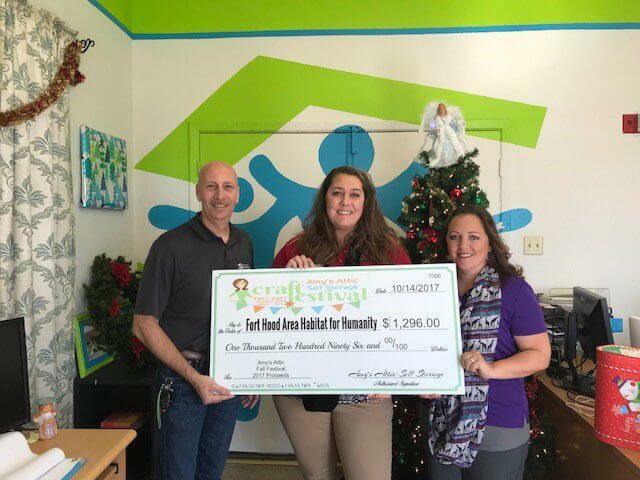 On the same day as the Chili Cookoff event, Amy’s Attic hosted a fundraising event that brought in $1,296, delivered by Chandra Howard and Lauren Gaston. For the local Habitat group, which helps people in need build and own their own homes, all the funds were welcome. Ending this year, Habitat completed and closed on three newly built homes and are very close to the fourth one. “The previous six years, only one home per year was completed and closed on, and no other projects,” Cates said. In addition, Habitat completed five home renovations that were part of a neighborhood cleanup project; two wheelchair ramps were built and three critical home repairs for Veterans were completed as part of their helping hands projects. Cates projects an even bigger year next year. A large project Habitat is working on is under way in Temple. By the end of next year, they hope to have 13 duplexes, which will provide 26 homes for homeless veterans. Each home is about 635 square feet. The property is located on the corner of 38th and Avenue N in Southeast Temple, and will be the first local community for homeless veterans that will allow them to own their own home, rather than a temporary shelter, officials said. For a separate project, Cates said he also has his eye on a piece of land in Nolanville and has been in negotiations with the owners. “I hope to know something very soon,” Cates said, adding the city of Nolanville is ready to support the project that will provide the opportunity for veterans with families to own their own homes as well. The veteran family community in Nolanville is projected to provide eight to 10 two- and three-bedroom homes. All Habitat homeowners are 100 percent financed through the Habitat office at zero-percent interest. “Every house we build we suffer an automatic loss,” Cates explained. The Habitat website has recently undergone an overhaul and now includes a list of their needs, to include bottles of water to a Kabota Tractor. “We also need the Duplo Legos,” said Melissa Cates with Habitat, explaining they will use the legos to build a model home for the home and garden show. Habitat is still selling tickets for their Dream Home raffle that will take place Feb. 10. The winner of the Dream Home will receive a new 3,100-square-foot home in an established Killeen neighborhood, as well as other prize options to win. To learn how you can help, or to purchase a raffle ticket, call the Habitat office at 254-680-4007, or visit FHAHFH.org.